After World War II the US government dumped millions of kilograms of unexploded bombs into the Gulf of Mexico. 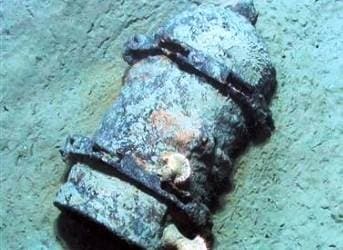 This is no secret; many governments dumped their unexploded ordnance into oceans and lakes from 1946 up until the 1970s when it was made illegal under international treaty. Now that technology has advanced enough for oil companies to drill deep sea wells in the Gulf of Mexico, those forgotten payloads have become a real hazard. The US designated certain areas around its coast for the safe dumping of explosives, nerve gas, and mustard gas. The problem is that the records of where these munitions were dumped are incomplete, and many experts believe that a lot of cargo was dumped outside of the designated areas. Now, decades later, no one has any idea of where the bombs are, exactly how many were dumped, or if they still pose a threat to humans or marine life. In 2011 BP had to close down its Forties crude oil pipe in the North Sea, which carries 40% of the UK’s oil production, after they found a four metre unexploded German mine laying just next to it. The giant mine was found during a routine inspection of the pipeline, and forced its closure for five days whilst engineers attempted to safely remove it and transport a safe distance away to be detonated. Professor Bryant remarked that he has come across 227 kg bombs off the coast of Texas and well outside the designated dumping grounds. He also said that at least one pipeline from the Gulf of Mexico had been laid across a chemical weapons dump site. Energy Independence in the US: Is the Impossible Possible? Oh come on; these things weren't made with rustproof containers. Sure, it wasn't the best idea to dump them there, but it's been 65 years, and those casings have rusted through long ago. Although its nasty, as soon as seawater gets in those munitions are neutralized. And after that it's just more sludge on the bottom of the ocean. the german mine referenced in the article is different, btw: it was built to be resistant to the corrosive effects of seawater. bombs meant to be delivered by air weren't. The old infinitesimal dilution theory! Capitalist keep this one going to rid themselves of the filth they make. Scatter it around where no one will notice. We have nukes now and no where to scatter anymore.